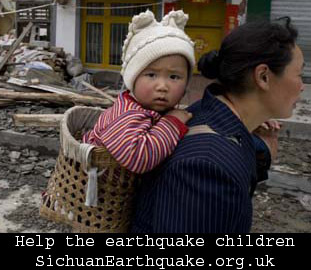 Children adopted from China are moved by the scenes of Sichuan earthquake and started to raise fund for the quake victims. Several organisations, like Half and Sky Foundation, Our Chinese Daughter Foundation, and Families with Children from China, New York Chapter, are also involved in earthquake relief fundraising. A small body frozen in a moment, surrounded by rubble. A terrified, bleeding young girl carried on a stretcher. Sobbing mothers clutching photos of children lost to the earthquake in China. “There for the grace of God go our daughters, and us,” said Sandi Janusch, who adopted 7-year-old Kaili from China as a baby. Moved by images of the tragedy and pulled by an invisible red thread that — as Chinese legend holds — forever connects her to her daughter’s birth country, Janusch wanted to do something, anything, to help. So she, Kaili and some friends baked. A lot. Together they raised $2,400 for relief efforts by making and selling gourmet fortune cookies — espresso and jasmine tea were among the specialty flavors sold eight to a decorated box — in Calgary, Canada. Where there are Chinese girls adopted by parents halfway around the world, there are bake sales, garage sales, dance performances, memorial services and cash campaigns raising money for earthquake victims in the country that united their families. The amounts raised are tiny in contrast to the nearly 69,000 people dead, estimated 18,000 missing and millions left homeless by the earthquake, but reaching out to their birth country is priceless to the girls and their families. Rescuers are preparing to dynamite the barrier of a swelling quake lake, which has posed a new threat after a devastating 8.0-magnitude temblor ravaged southwest China’s Sichuan Province. Helicopters had airdropped professionals and materials for the operation by 7:49 a.m. Monday onto the dam of the barrier lake at Tangjiashan in Beichuan County, which was formed by landslides that blocked a local river known as Jianhe after the May 12 earthquake. Sunday’s adverse weather hampered the operation, but the weather and visibility were fine on Monday morning, said a spokesman with the Mianyang Airport Headquarters for Quake Relief Flight Operation. A Mig-26 helicopter had carried a large bulldozer from Leigu in the vicinity of Tangjiashan which could only be reached on foot currently. As a backup operation, a group of armed policemen arrived on foot at the Tangjiashan lake area at 00:35 a.m. Monday and set to work immediately. They would assault the lake barrier in case bad weather and low visibility continued to hamper airdrop efforts. Posted in News | 9 Comments » | Read more..
Posted in News, Stories | 10 Comments » | Read more..
Our hearts have been sadden and touched by the recent earthquake in China . . . especiallly sad to have lost so many school children. following the quake by one of our professor friends at Nanjing University. It shows the feeling there. Just want to share it with you. And thanks becky, my dear US teacher when I was in nanjing University, for the sharing. A candle vigil was held in Glasgow city centre on 25 May in memory of the victims of Sichuan earthquake. Posted in News | No Comments » | Read more.. The children’s faces stare in somber black-and-white photos from newspapers and scribbled posters at relief camps, seeking their parents. Many will never find them. 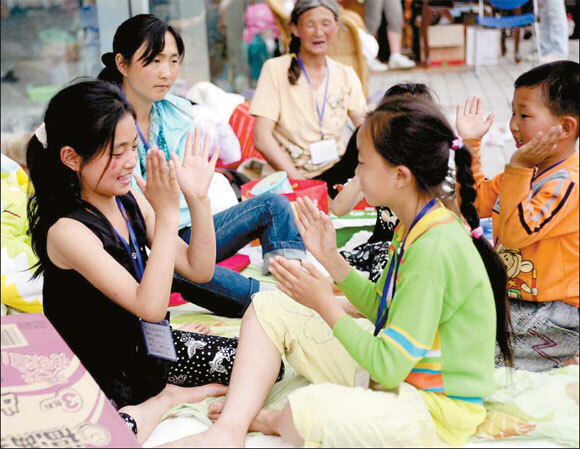 As the first estimate of orphans - more than 4,000 - emerged Thursday from last week’s deadly earthquake, thousands of Chinese are rushing to offer their homes. “My husband and I would really like to adopt an earthquake orphan (0-3 years old),” Wang Liqin wrote on popular Web site Tianya.com in a forum that was already three pages long. The high interest is another sign of China’s tremendous post-quake outpouring of sympathy, buoyed by rising prosperity. And it’s a surprising turnabout in a country in which government red-tape, poverty and traditional attitudes long combined to discourage adoption. The new enthusiasm also means that Americans and other foreigners wanting to adopt may not have a chance. Officials estimate that the number of Chinese wanting to adopt the earthquake’s orphans may outnumber the orphans themselves. Posted in News | 11 Comments » | Read more..
Yang has just returned from Shanxi province where he worked in a mine. His wife died when the cyber caf she used to work in collapsed. His nine-year-old daughter escaped miraculously, though hundreds of her schoolmates died when their school building collapsed. Yang and Deng Xingyou, a retiree, are sitting on the rubble of building with their surviving relatives. Two bundles of clothes and quilts and a bottle of edible oil lie near them. Both of them returned to Beichuan county from a shelter in Mianyang city on Monday in the hope of finding their loved ones. Though many people have been found alive under the debris of buildings after five, six or even seven days, the chance of finding one now is too remote. Posted in News, Stories | 4 Comments » | Read more..